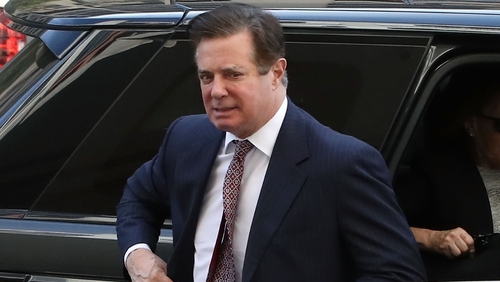 US President Donald Trump's former campaign chairman Paul Manafort will co-operate with Special Counsel Robert Mueller's probe of Russian election meddling as part of a plea deal, prosecutors told a federal court in Washington today. Manafort, 69, also pleaded guilty to two criminal counts, becoming the most prominent former Trump campaign official to plead guilty in Mr Mueller's investigation. The probe has cast a shadow over the Republican's presidency and Manafort's decision to co-operate deals a setback to Mr Trump ahead of congressional elections on 6 November. A longtime Republican operative, Manafort made millions of dollars working for pro-Russian Ukrainian politicians before taking an unpaid position with Mr Trump's campaign for five months. He led the campaign in mid-2016 when Mr Trump was selected as the Republican presidential nominee at the party convention. Manafort pleaded guilty to one count of conspiracy against the United States and one count of conspiracy to obstruct justice brought by Mr Mueller's team. Other counts were dropped. Before Manafort's appearance, there was some discussion that he would plead guilty without co-operating and perhaps later receive a presidential pardon. Mr Trump had not said he would pardon Manafort, but nor had he ruled it out. Rudy Giuliani, the former New York City mayor who is now representing Mr Trump in the Russia probe, said before the hearing that a guilty plea would not crush Manafort's chances of receiving an eventual presidential pardon. "It’s not going to hurt him if he pleads guilty. Usually it helps you get a pardon down the road. It shows you’ve admitted your guilt," he said before the deal was announced. He declined further comment until after the hearing. Manafort made millions of dollars working for pro-Russian Ukrainian politicians before taking an unpaid position with Mr Trump's campaign for five months. Prosecutors had accused him of hiding $16m from US tax authorities he earned as a political consultant in Ukraine to fund an opulent lifestyle and then lying to banks to secure $20m in loans. The jury in that case deadlocked on 10 counts that were dropped today as part of the plea deal. Mr Trump last month praised his former aide for not entering into an agreement with prosecutors, as the president's former personal lawyer Michael Cohen had.